Knob & Tube wiring was installed in houses up until about 1950. This system consists or two wires, one black or hot wire and the other white or neutral to create a circuit. These two single wires are held in place with ceramic knobs and tubes. Knobs are used to clamp the wire to the structural member, while tubes are placed in holes in the structural members to prevent the wire from chafing. 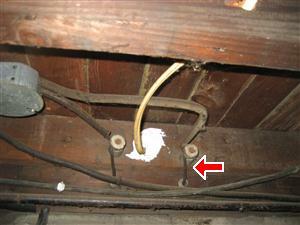 Knob and Tube wiring is still found in many Century or older homes. Many times visible wiring in basements and upper floors have been upgraded with the old knob and tube being removed or cut off. The Barrie Home Inspector has performed hundreds Century Homes Inspections and receives many referrals from Real Estate Agents and past clients due to this knowledge. Unfortunately knob and tube wiring is still being found in attics or places where replacement is difficult. During home inspections I have found homes where there has been a complete re-wiring of home but the electrician has still used live knob and tube in the attic to complete circuits. This would be typically done without the home owners knowledge and is very poor workmanship. The safety of knob and tube wiring deteriorates as the system ages and deteriorates. Many of the porcelain knobs and tubes may crack or break, old wires sag and fray, and the sheathing turns brittle and falls off, exposing the live wires. Homeowners may improvise their own repairs as replacement parts may not be readily available which results in some very dangerous modifications. Most insurance companies will not insure your home if you have knob and tube wiring. Finding out this information prior to buying a home is in your best interest. The seller will typically fix this type of problem if identified prior to completing sale of home. Hiring a professional home inspector can save you needless expense and worry. The Barrie Home Inspector offers a 100 % Money Back Guarantee for every inspection. • • Have a licensed electrical contractor check the “knob and tube” conductors in your existing installations for sign of deterioration and damage; or request a general inspection from ESA. The General Inspection report will identify visible electrical safety concerns in your electrical wiring. • Removing ground pins – ground pins on power bars or electrical equipment should not be removed to accommodate the two pin receptacles used in knob and tube wiring (2 pin to 3 pin are not permitted) Improper replacement of two pin receptacles. If you require a three prong receptacle, only use a GFCI receptacle. Older homes that have knob and tube wiring will typically have had Asbestos used in their home at one time or another. Have your home professionally inspected prior to purchase and have any suspected Asbestos tested to ensure health and safety of your family. Another common item in older homes are wood stoves and fireplaces. Most insurance companies now require a Certified WETT Inspection prior to issuing home policy. Have your WETT Inspection performed for only $50.00 when part of home inspection package. Read more about Asbestos Testing in your home. FREE Thermal Imaging scan of all exterior walls and ceilings with Infrared Camera. Find hidden moisture, missing insulation and electrical hot spots. What could your inspector be missing while inspecting your home if not using all the available technology.